Welcome back to Fridays with Jim Korkis! Jim, the dean of Disney historians, writes about Walt Disney World history every Friday on yourfirstvisit.net. One of the most popular attractions at Disney theme parks is Dumbo, inspired by the 1941 animated feature of the little elephant who, thanks to his large ears, could take flight into the skies. It was one of the original attractions at Disneyland. Dumbo is known as a “hub and spoke” attraction because the ride vehicles rotate on an articulated armature connected to a central hub. Guests use a lever inside the vehicle that operates a hydraulic ram to control the vertical height. For decades, all versions rotated counterclockwise. When the attraction first opened at Walt Disney World, the elephants were missing their hats and the attraction was missing the iconic Timothy Mouse figure who was added about two years later. In 1993, the attraction was expanded to sixteen vehicles to meet the demand for the ninety-second ride. The original concept for the attraction was not multiple Dumbos but ten pink elephants on parade from the film. Supposedly, Admiral Joe Fowler questioned having children riding an alcoholic hallucination and Walt quickly agreed and had all the elephants painted gray. Magic Kingdom’s Fantasyland underwent a large expansion and renovation that resulted in Storybook Circus being added to the area in 2012. The Dumbo attraction was moved to this new section with a new interactive, enclosed queue resembling a Big Top circus tent that serves as a playground, as well as water fountains that change colors at night. The original Dumbo carousel spinner closed on January 8, 2012. The new spinner (the first Dumbo ever to spin clockwise) soft-opened on March 12, 2012. The original spinner was refurbished to match the new theming of the attraction and be a fraternal twin of the new spinner. That new spinner soft-opened on June 15, 2012. Richer paint shades were used and the bottom of Dumbo’s feet are now pink. The new attraction’s two spinners separated by about fifty feet rotate in opposite directions, so that those looking at the middle of the attraction will see elephants moving toward them on both sides of the walkway. High in the play tent queue is a flying Dumbo and Timothy Mouse. The area includes a tall burning-building set as seen in the film — the climactic scene where the title character discovered he could fly. Pull a cord near the fireworks display to set off a light show with strobes. Benches line the outer edge, providing rest for parents who have been given a ticket-themed pager to let them know when their group can board the ride. A center ring, designed primarily for 2- to 3-year-olds, has interactive elements such as a little fire truck with horn, tap-touch lights and various cranks. Step on animal prints and it creates noises. 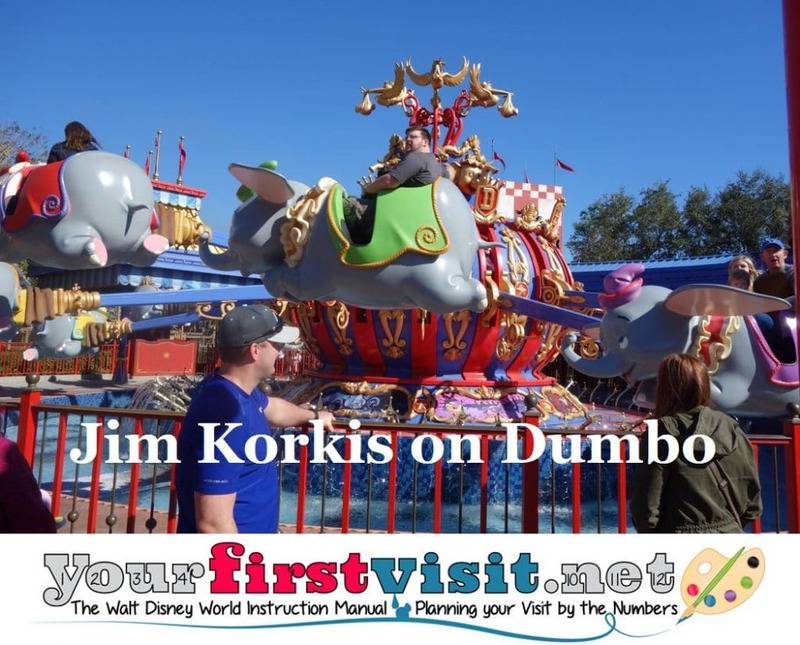 The Dumbo attraction inspired imitations at other amusement venues such as Bulwagi’s Flying Adventure at Lion Country Safari in Loxahatchee, Florida; Amazing Flying Elephants at Dollywood in Pigeon Forge, Tennessee; and Elephant March at Silver Dollar City in Branson, Missouri. Thanks, Jim! And come back next Friday for more from Jim Korkis! 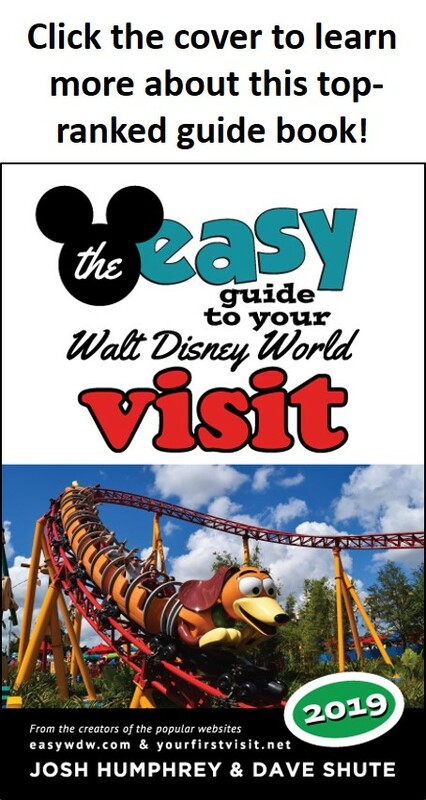 , which reprints much material first written for this site, all published by Theme Park Press.